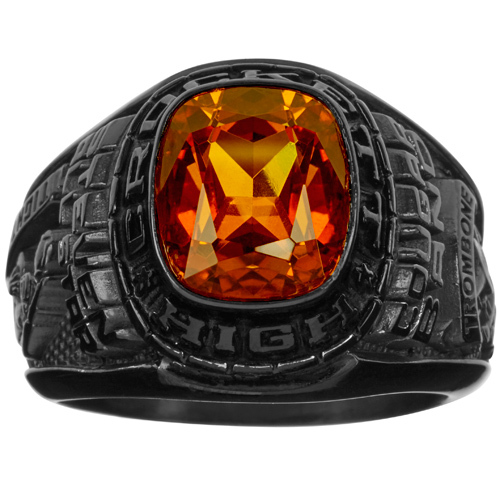 The boys Triumph class ring in eclipse Siladium has an oblong 12mm x 10mm stone. Personalize the ring with your choice of stone color, side emblems and engravings. This large style ring is made by ArtCarved. Ring top width: 19mm, palm width: 7.2mm. Black-toned stainless steel ring has a solid back. Enjoy ArtCarved's limited lifetime warranty. Import. Choose a state and a menu of high schools for that state will appear below. Inlay your encrusting on your stone. The color of the encrusting matches the color of the metal of the ring. Looks best with darker stones. Create a unique floating, 3 dimensional effect on your stone. Choose a design under stone from the menu above and it will appear on the right. Looks best with lighter stones. If you did not enter a year for line 1 you can engrave a second line for an additional $20. I brought this ring for my fianc� who never had a school ring and he loved it. He was a football star back then in 1987, and people comments on his ring all the time. Good quality. Love the style. My son loves it just as much! Great price and quality for his Senior Ring! Wonderful Choice! Great customer service and a beautifully done, one of a kind ring!